Hose End sprayers have several adjustment nozzles, featuring a positive lock-in settings system for spray applications. 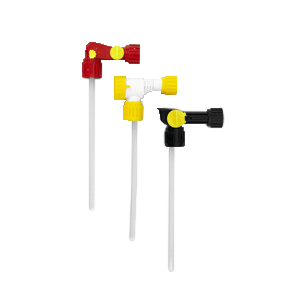 Hose End sprayers are available in a variety of colors, styles and dip tube length configurations. With a variety of industrial and consumer sprayers available the outage for product can range based on the density of the product your mixing with water. All sprayers are designed to work with a standard garden hose finish. Ideal for household cleaners, automotive protectants, and stain removers. Due to the different combinations that this sprayer could be offered as, we request that you please call with your specific inquiry.